I painted “Palm Sunset” to match a bedroom I had all adorned in tropical theme. I have great interest in interior design, so naturally, painting goes right along with that. If I want something to go on the wall to match the room, I just paint it. My bedroom is now black and white, and “Palm Sunset” brightens the home of a friend. I’ve always loved the ocean, warm weather, and beautiful sunsets, and I’m thankful to now live in a tropical setting. I can look out my window and watch the palm fronds swaying in the wind. Inspiration is everywhere! 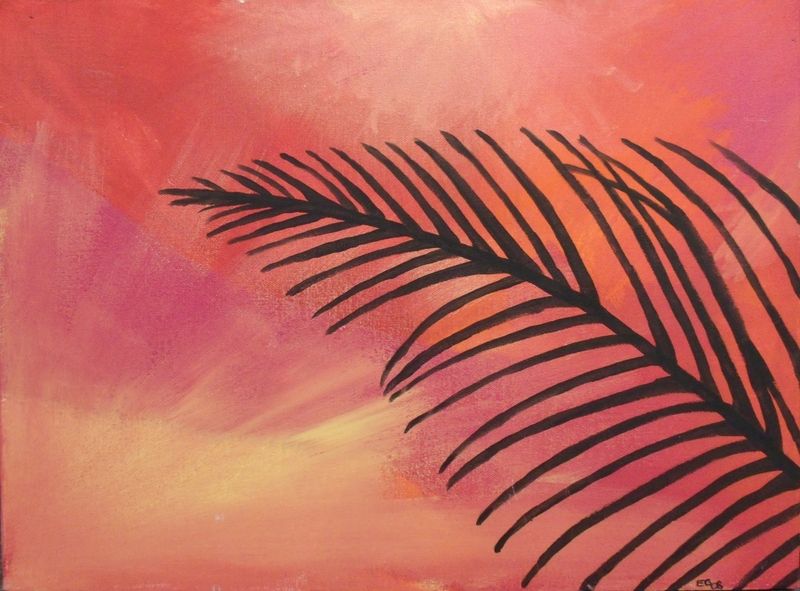 This entry was posted in acrylic, art, painting, palm, palm frond, red, sunset, tropical, Uncategorized and tagged acrylic, art, painting, palm, palm frond, red, sunset, tropical on May 30, 2013 by Jumping Jack Studios. Really nice piece, love the warmth in the sky. 🙂 Could do with that here! Ooh go on rub it in 😛 It should be in full swing here too! But it’s grey and murky and chilly. Not even a thunderstorm to liven things up a bit! Ah well.